Microsoft's glasses-free 3D lens directs light to each eye individually to create 3D images. Image credit: Microsoft. 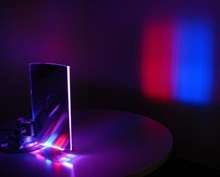 (PhysOrg.com) -- Although today's 3D displays require viewers to wear special glasses, many research groups are working toward glasses-free 3D displays. Most recently, Microsoft’s Applied Sciences Group has demonstrated a stereoscopic 3D display that projects different images to a viewer’s left and right eyes, and doesn’t require glasses. The display uses a viewer-tracking system, which consists of a camera that tracks viewers’ eyes and a lens that steers light directly into the viewers’ eyes by switching LEDs along its bottom edge on and off. The key to the lens design is enabling it to control light in a specific way. The lens is tapered, with an 11-mm thickness at the top and a 6-mm thickness at the bottom. The LEDs shine light into the back of the lens at a certain position and angle, and the lens determines how the light bounces around and where and at what angle it escapes the lens. By replacing the traditional backlight in an LCD TV, the thin lens can turn a 2D display into a 3D display. At this stage in development, the 3D display can project images to only two viewers, since a standard 240Hz LCD TV can project four 60Hz views. A refresh rate of 60Hz is about the slowest possible before the frames start getting jerky. At this speed, the display can also project 2D images to four people, since each viewer only needs one view. In order to accommodate more viewers, Microsoft is pushing display manufacturers to make faster LCDs. The company also hopes to increase the 20-degree viewing angle to at least 40 degrees by tweaking the lens design. The stereoscopic 3D technology could also have applications besides 3D TV due to the fact that each viewer receives their own unique view. This feature makes it possible for viewers to see completely different things on the same screen. Microsoft is investigating how to integrate the lens into the backlight of a laptop, where it could project a private view to the person sitting directly in front of it, and a completely different public view in all other directions. Although the concept of viewer-tracking 3D displays has been around for a long time, only recently have computers become fast and inexpensive enough to accommodate the high-speed requirements of viewer-tracking systems. Microsoft’s display, with its novel thin lens design, overcomes another challenge: reducing the bulkiness of earlier prototypes. The lens shape allows the researchers to decrease the distance between the projector and the screen because light can travel within the lens rather than in air. Since the market for 3D TV is expected to grow from 2.5 million sets shipped in 2010 to 27 million in 2013, Microsoft’s 3D display and others will likely continue to improve over the next few years. Philips had a 3-D display in production for some time but withdrew it from the market. Probably because of lack of demand, considering one practically needed a phd in physics to set it up, but also because of cost. What an absurd idea. Epic fail right from the start. So for 6 people to watch the movie, I need a 720Hz TV? If you can't make it 3D for everyone watching regardless of where they are without glasses, don't bother. No wonder Windows 7 is so expensive!